Experience the Wonders of Jordan with Foundations of Faith! Jordan is a country rich in contrasts and biblical heritage. The experts at Foundations of Faith have created a trip to this magical country to leave you with lasting memories that are sure to last a lifetime. One of the most revered holy sites of Jordan, this is the place from where Moses looked out over the Holy Land. During his visit to Jordan in 2001, the late Pope John Paul II preached here. For more information or any questions about this trip, please contact Ron directly at ron@foundationsoffaith.com! Today we're bringing you a wonderful article written by Robert Berger of VOA News that highlights the influx of pilgrims to Jerusalem this Easter season. 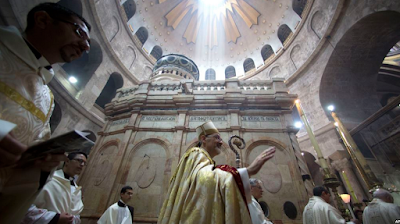 Berger writes that after a beautiful sunrise service on Sunday that the group of pilgrims headed to the historic tomb where it is believed that Jesus was risen. Berger continues to illustrate the spiritual surroundings where pilgrims came from all over the world to experience Easter where, according to the New Testament, these events took place. Read more of Berger's account of the day by clicking HERE! Upcoming Pastor Trips with Foundations of Faith! Today we're featuring our upcoming pastor trip! If you're interested in experiencing this trip with us, please e-mail us today for more information! Sightseeing with outstanding English speaking licensed Bible scholar guide in private deluxe vehicle. We're always updating the Pastor Trips page of our website so be sure to check back frequently! religious pilgrimages that allow individuals, groups, and churches to further explore their faith. Foundations of Faith New Website! We're so excited to announce that our brand new website is officially live! Be sure to check out the new look and read into all of our destinations and exciting trips for Pastors and Ministers. Whether you're looking to plan a journey of a lifetime for yourself, your family or your religious group, we can help you do just that. Visit our new site HERE! Foundations of Faith is a full-service travel agency specializing in designing religious pilgrimages that allow individuals, groups, and churches to further explore their faith.